A group of Merrimack, New Hampshire Police Officers are on their way to Virginia to attend the memorial services for 2005 Merrimack High School graduate, Officer Ashley Guindon. Meanwhile, the purple and black bunting hangs at the entrance to the police department indicating that hearts are heavy in this community. "For us it's the least we could do," said Lt. Denise Roy. "We're hoping that her family will see that she matters, her life matters, she didn't die in vain." Officer Guindon was shot and killed on her first day as a Prince WIlliam County Police Officer in Virginia. 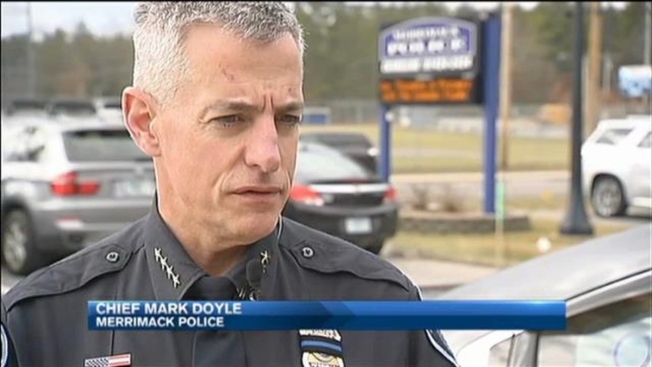 "Hours after she took that oath to protect and serve, she is struck down in the prime of her life at the onset of her career," said Merrimack Chief Mark Doyle. "It brings back I think and puts into perspective what our officers do everyday." Guindon was born in West Springfield, Massachusetts where her grandmother still lives. Dorothy Guindon talked with us over the phone Monday morning. "Her father was military, so she joined the military herself. She was in the Marines. She enjoyed life and that's really all I can tell you," Dorothy Guindon told NECN. Guindon's father died when she was in high school. Her former principal Kenneth Johnson remembers the heart ache. "I feel for her mother and extended family for they have experienced more tragedy than any family should," he said. Johnson led a moment of silence on Monday as faculty, staff, and students remember the smiling face in the 2005 yearbook. Under her photo, Guindon wrote, "Live for something rather than die for nothing." "It's very surreal," Lt. Roy said. "You read what she wrote and it's almost like did she know? That she had to do something with her life, because you cannot take one moment for granted." Memorial services are open to the public in Woodbridge, Virginia starting at 10 a.m. Tuesday. Guindon's grandmother says her remains will be escorted back to West Springfield where she will be laid to rest next to her father.